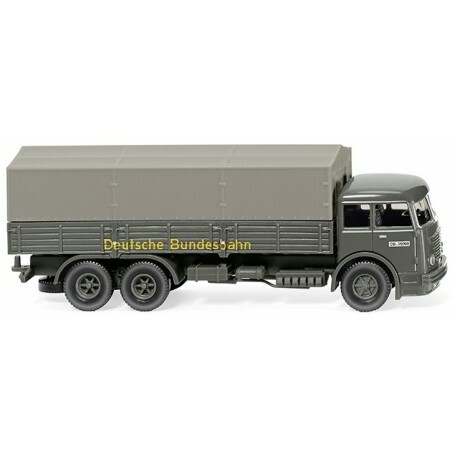  Flatbed lorry (Büssing 12.000) "DB"
Flatbed lorry (Büssing 12.000) "DB"
Flatbed lorry (Büssing 12.000) 'DB', 1951. Driver's cab and flatbed in dark grey, flatbed insert olive-brown. Front bumper dark grey. Interior with dashboard and gear shift in black. Chassis with Cardan part and wheel rims dark grey. Headlamps, window frames, door handles and Büssing ornamental trim in silver. Sides of cab with 'DB-39098' lettering in white and black, DB logo on front in white and black. Side design of flatbed with 'Deutsche Bundesbahn' lettering in golden yellow.